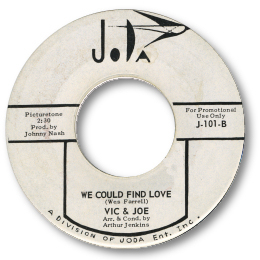 The best known duo on Johnny Nash and Danny Sims’s label were of course Sam & Bill – but as you can hear Vic & Joe were no slouched when it came to emotional singing. Great harmonies and a lovely climbing set of chord changes make this unknown 45 We Could Find Love a real winner. Nash does a good job on the production but arranger Arthur Jenkins takes the honours for that lovely weaving horn line. Cut in New York.